Week 2, Day 1. Lowering our blood pressure. Today's tip is know your numbers. I can only tackle my blood pressure issue because I know it was high. I got my A1C last year and it was pre-diabetic so I'm waiting to get this years numbers any day. 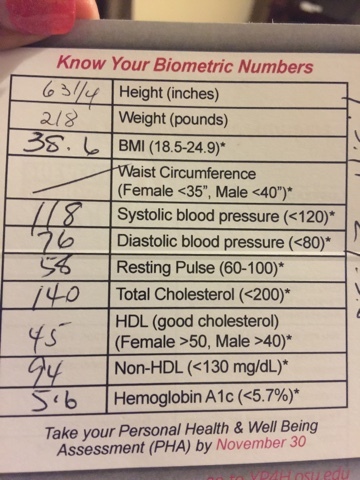 My BMI reduced last year from 43.75 which is morbid obesity (morbid means deathly, by the way, to 38.26 which is obese class 2. I'll take it!!! And I expect it even lower by the end of the year. I am doing all this hard work like the 1.5 hour hip hop dance class I attended tonight because I know my risk factors. My family history of high blood pressure, diabetes, cancer, sleep apnea and stroke put me at high risk as does the auto immune disease I have, fibromyalgia. I got a late start, so I have to work hard to catch up. I thank God everyday for my health and because I know my numbers, I know what to work on! Make an appointment with your family doctor or attend a local health fair to get screened! You cannot change what you will not acknowledge! You can change!